For posterity’s sake, I thought I would record the painstaking (painTstaking!) 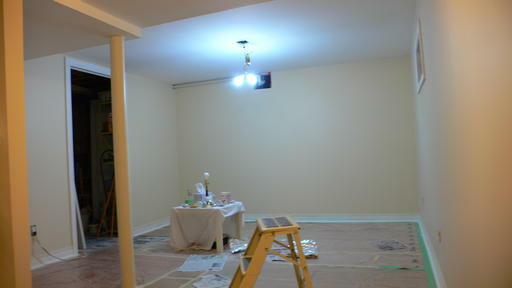 process of getting the basement painted. I didn’t record the DAYS it took to fill in holes and gaps, to sand, and fix some electrical anomalies (I didn’t do the electrical, of course). That was most of last week. If I can manage it, I’ll post what I’m up to this week. Last day of filling holes and sanding. 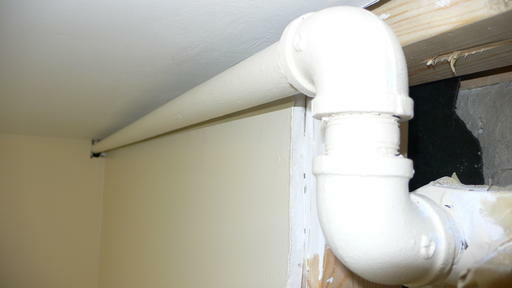 The previous owners painted latex over oil. Don’t do that. Ever. (Or I will come and slap you.) I scraped/sanded it, and will try putting a good quality oil primer over it, but I’m pretty sure it’ll start flaking off again in the future. 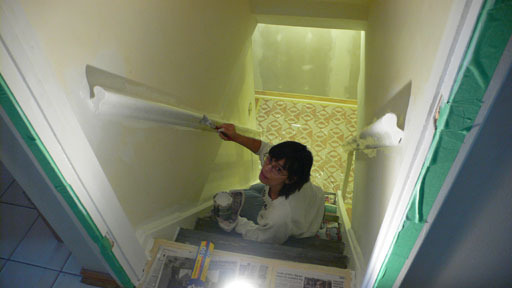 The stairway needed a LOT of work. Won’t turn out to be perfect but that’s okay. 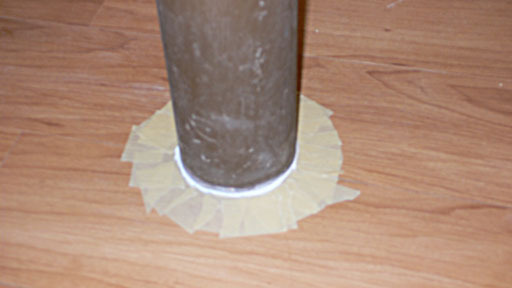 Started the process of protecting the floor, by placing masking tape snug up against the quarter rounds (baseboards) around the perimeter of the room. It’s my “foundation” onto which I will tape plastic, cardboard and whatever else I can find to cover the floor. But it took most of Monday just to tape the perimeter and other odds and ends. Finished protecting the floor by using old shower curtains, plastic wrapping from furniture delivered, and cardboard. Blast it, it took all day!! I should be able to paint tomorrow. Oh my god! Finally!! Actually put brush to wall. I’ve been dreaming of this for weeks! I was determined to get the whole thing primed in one day. It only took 11.5 hours. My hands are aching from clutching the brush and roller all day. And painting so much ceiling is very painful on my neck. When I could, I’d hold my head with one hand and paint with the other. 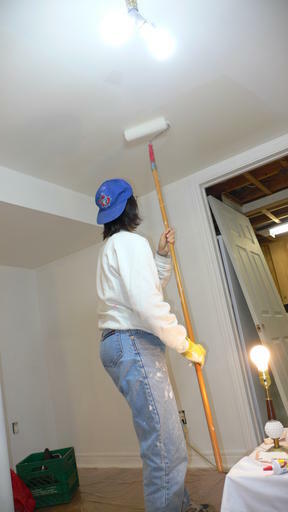 But usually, I needed two hands to use the roller on the ceiling. Maybe I should invest in a neck brace? I would love to get the ceiling finished tomorrow. I’ll get one coat on, but may not be able to get two. 9pm. I thought I’d be out of the basement earlier today. I’ll probably touch up the ceiling a bit tomorrow. But hopefully, I can start on the walls. And in my wildest dreams, I hope to get two coats done. “Cutting in” will be a horror with all the duct work. Wish me luck. There’s a disturbing trend happening – this time I finished at 10pm. But, I guess it’s ok since I started an hour later than usual, but that’s still 12 hours. The walls are done. Yay!! I was a little shocked with how dark the colour was and waited anxiously for Reid to wake up. He had chosen the colour, saying he wanted something very light. This wasn’t very light. I was worried he’d think it was too dark. I would sorely hate to start over. No matter, he came down and said “The colour’s great!!”. To each his own. I don’t think I really like it. I’m pretty good at getting a straight edge between the walls and ceiling (“cutting in”) since I’ve had so much practice, but it was hard this time. 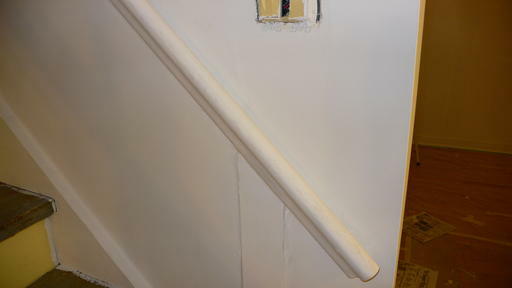 It’s a little bumpy along the top of the wall, so edging it in brings out the bumps. Of course, I see lots of little problems that I’m sure I will never notice again unless I’m inches from the walls. Occasionally, I’d remind myself that most of the wall space will be covered with shelves. But I’d also remember moving into my house and finding that the cream coloured master bedroom used to be green, and I know because they had painted AROUND the bed headboard. Guess they didn’t bother removing the bed when they painted!! So I tried to do as good a job as I could. 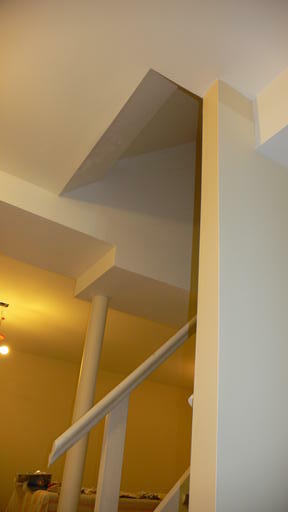 Tomorrow – I hope to get the trim done, but may spend some time on the stairwell. I’m hoping two more days will do it. I’ve got to finish by Wednesday when I go visit my parents. 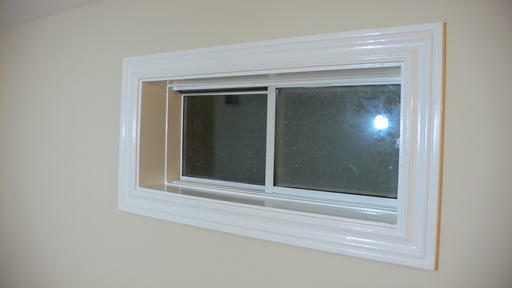 Another late night, but, the trim is all done, as well as the windows and the stairway walls. I had to spend a few hours getting the tape up from around the baseboards. I was worried that if I waited for it to dry completely, then the paint would come off the quarter rounds as I removed the tape. I seem to remember this happening to me before, but it must have been long ago. 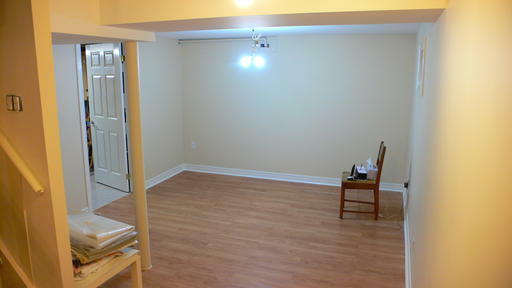 When I went to the basement this morning, I found I liked the colour. The colour changes slightly in the evening, and that’s when I like it a little less. 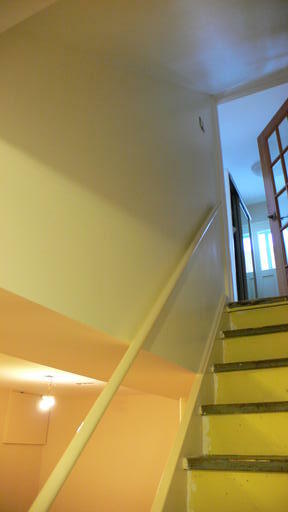 Tomorrow is the last bit of painting – the evil banister, the sides of the stairs and the door to the laundry room. Now it’s time for that back massage that was promised me. I’m so incredibly sore all over. I can’t imagine doing this kind of thing as I get older. The gas pipe. They wanted to box it in for us to make it neat, but I didn’t want to lose the space as I need to put something tall under it. Yet another late night, but it was an easier day on the whole. 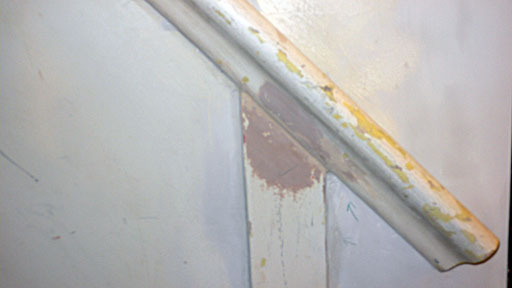 The banister gave me lots of trouble. When I put my first coat of latex enamel (Benjamin Moore) on, I kept noticing little bits of things I thought were on the brush, or on the wall or something. Turned out it was tiny bubbles. I had a slight heart attack and went back to the store with the paint. I thought something was wrong with it (bought it only 2 days ago, yet found it separated, with a thick film of orange stuff on the top). The fellow at the store insisted it was a problem under the primer, but I had my doubts. When I went back home, Reid and I took a good look at it and decided it would be ok to continue. I found I could brush away the bubbles, and on the whole, it still looked fine. 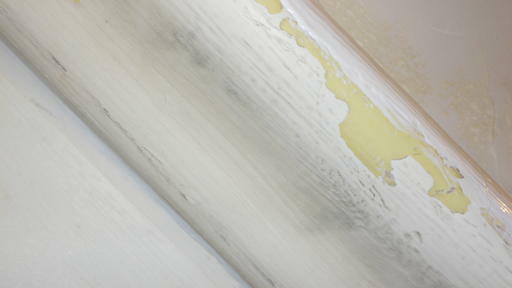 After some time, though, the paint would become quite frothy on top. Almost like a milkshake. Also, if the problem was indeed under the primer, then the bubbles would actually be raised primer, and I should be able to see the original paint underneath. I’ve had this problem before, and this wasn’t the same. 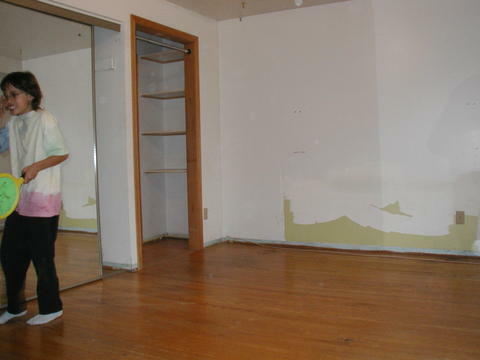 In my first house, I took down some wall paper from my bedroom wall and scrubbed the wall clean. Then I painted, and tons of bubbles formed. When I burst a bubble, I found that not only had my original paint come up, but so had the layer under that! So, two paint jobs before, something had gone wrong. Perhaps the wall wasn’t cleaned properly, or they put latex on oil. Ever since that horror, I make sure I clean the walls properly before I paint, so that if I paint again, I won’t have a problem. The other bad thing was that I needed to wait 8 (!!) hours before recoating. Should have read the side of the can after I bought it instead of when I started to use it. Which is why I had to work later into the evening. But now I’m done, done, done!! Tomorrow I’ll take up all the drop sheets (drop plastic-and-cardboard actually), and start the finishing touches. Perhaps I’ll wire up the ethernet ends and add them to the plates. An easier day today, as I start the process of putting things back together. It’ll be a while yet before Reid can move in, but at least the painting is all done!